The photo of the Venezuelan passport and TT identification card in the name of the same person. NATIONAL Security Minister Stuart Young has ordered an investigation into what appears to be a photograph of a Venezuelan passport and a TT identification card belonging to the same person. Young, in a statement yesterday said, he became aware of the situation after concerned citizens forwarded the photo which is being circulated on social media. 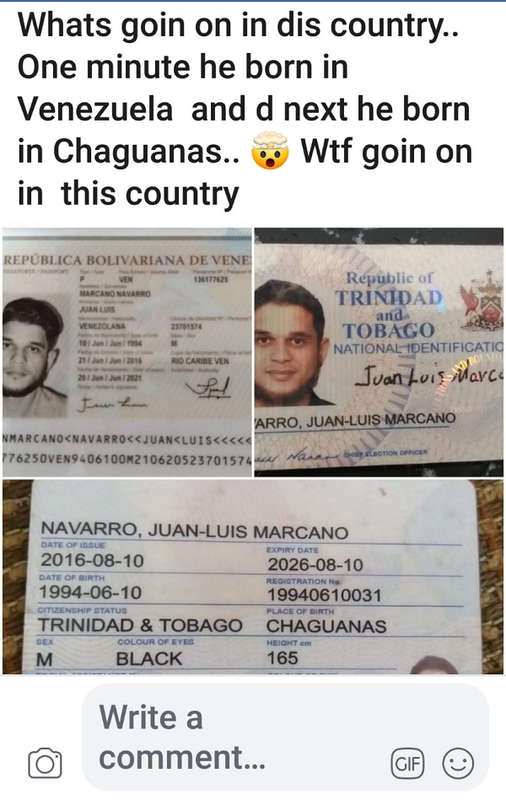 The photo on Facebook show a passport of a man from Venezuela and then a Trinidadian identification card with place of birth “Chaguanas”. A Trinidadian woman posted her identification card, and the registration number is identical to the one in the name of the Venezuelan man. Also in a statement yesterday, the Elections and Boundaries Commission (EBC) said it has completed a thorough search of its database and can say no TT national identification card was ever issued to the Venezuelan man. The commission said the man’s name does not even exist on its database. “The EBC is aware that the Minister of National Security has issued a press statement and has initiated an investigation. The EBC will provide every assistance to the respective agencies in resolving this matter. Maharaj said the minister’s statement indicated that his own ministry will be investigating its own agencies and departments. Reply to "EBC: It didn’t come from us"